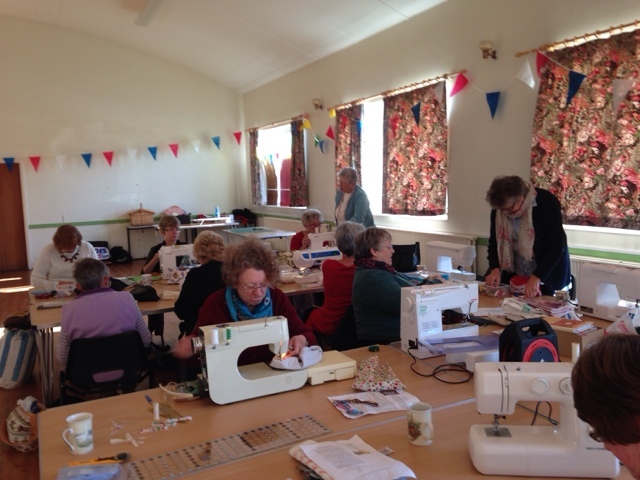 What a lovely meeting of Country Roads Quilters we had today. It was our Christmas meeting as we do not meet in December when things tend to get rather frantic. We had a selection of special items for the day. Two members led mini workshops. Before lunch, Tess led us in making bags for Beads of Courage. This is a wonderful project that supports children with serious illnesses. Several ladies are going to make more bags before our next meeting when we will photograph everything we have made before getting them to the project's co-ordinator. Thank you Tess and Trish. I skipped over lunch there but must tell you that we had a feast of a lunch. It was a "faith" or bring and share lunch and the ladies had pulled out all the stops. There were savouries and chocolatey sweets, all homemade and the ladies had brought plates, napkins, doilies, everything necessary for a festive buffet. I had to leave our meeting early to look after bigger grandson but I look forward to seeing the finished bead bags and book wraps in January and think I will suggest we have a "secret Easter bunny" present lucky dip! Happy Christmas to all the Country Roads Quilters. Gee, Christmas... and it is still November. And I thought I was behind ... Yep, maybe I could catch up by Easter too. Why are all my friends so well organised? I have to make a move, or, I too, will find it is Easter before I can celebrate Christmas!